VictoryGreymon is a Dragon Man Digimon whose name and design are derived from "Victory Greymon". 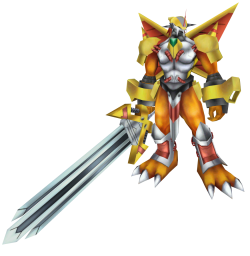 A subspecies of WarGreymon, whose body is clad in armor of the super-metal "Chrome Digizoid", it easily wields its gigantic crushing sword "Dramon Breaker", and is the "Dragon Warrior of Heroes" that fights against its opponents with unique sword techniques. Furthermore, VictoryGreymon possesses an evolutionary code that differs from Digimon that were naturally born in the Digital World, and it is thought that it is a Digimon that Digivolved from a Digi-Egg that was produced due to artificial data intervention. Trident Gaia Fire attribute 4 seconds cooldown 75 DS consumed skill points per upgrade Learned at Lv. Dramon Break Fire attribute 8 seconds cooldown 206 DS consumed skill points per upgrade Learned at Lv. A superb technique where the dramon braker is waved around to hit and grind the opponent. This page was last modified on 9 March 2019, at 14:31.